Measurements: 2.75 x 4.25 inches; or 70 x 108 millimeters. Back of card: Light tan with Suni sun. In the center of the sun, a ladder leading up - or down. Book included: The Medicine Woman Inner Guidebook, by Carol Bridges. Published by US Games, 239 pages, 4.5 x 7 inches, 118 x 176 mm. Covers each card in detail, small black & white illustrations for every card. Includes suggested card layouts. Booklet included (packaged inside deck): Yes, 21 pages, 2.75 x 4.2 inches; or 66 x 105 millimeters. 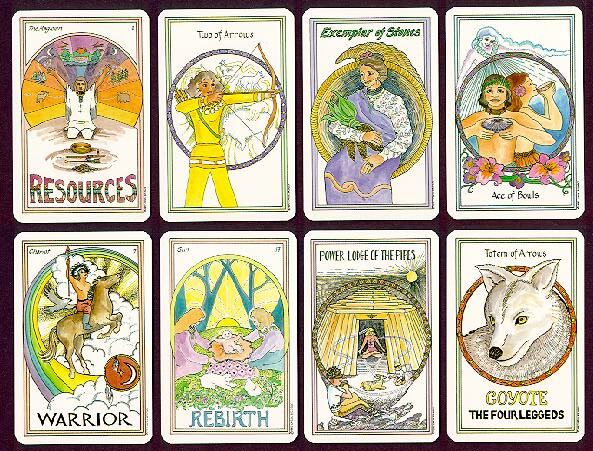 Comments: These cards honor Mother Earth. Minor Arkana suits are arrows, pipes, bowls & stones. The cards guide one through the seasons & the powers they provide to all who live in the Earth's embrace. Cards depict feminine strength in both men & women. Court cards are: Exemplar, Harvest Lodge, Totem & Apprentice. "Welcome, energies of earth, air, fire & water. Let us create a life of beauty, reverence & wonder. With each season, let us rejoice. Through every phase of sun & moon, let us be in harmony. In every direction shall we offer our love." - notes adapted from the cards, & from the US Games catalog. Book & deck available separately. Deck: $14, book: $12.95. We looked twice at those prices, too. Special note: People have asked if these cards can be used for medical diagnosis. This is not the intention of these cards. Indians use the term, "medicine" to mean, "in the nature of" an animal, "in the spirit of" an animal, "in the style of" an animal, etc. Used creatively, you can use this - or any other tarot deck - to diagnose health, but we think you'd be crazy, frankly, to use a deck of cards in place of seeing your doctor.